The real evidence of the paranormal: Sleep Paralysis Demon or Ghost cause ? Regardless of whether one accepts the medical explanation, or the paranormal theory for this surprisingly common condition, there is no escaping the fact that it is a terrifying experience for the sufferer. Sleep paralysis is closely related to the natural paralysis occurring in the REM (Rapid Eye Movement) state of sleep. The victim is fully conscious and alert, yet the body remains paralysed. In this state, the brain is capable of manifesting intensely vivid hallucinations, which the body cannot react to. The understandable reaction to this scenario is fear and panic. To the sufferer, the experience is terrifyingly real. All the natural senses of the individual remain fully functioning, i.e. smell, taste, touch, hearing, and sight are all present and only add to the horror. During REM sleep the body’s metabolism is slowed down, the heart rate is lowered, as too is blood pressure and respiratory rate. Along with this comes muscle paralysis; all these adaptations are a safety mechanism to prevent injury during the dreaming state. Without this natural defence, the individual could thrash out with limbs and enact their dreams. With a reduced heart beat and respiratory rate the victim will experience the feeling of pressure on the chest wall and a difficulty in breathing. In this natural state of fear and panic, the victim may well interpret this sensation as some kind of weight on his/her chest. Some victims of this horrifying condition are able to convince themselves that the experience was no more than a dream – a nightmare at worst. Others remain convinced they have been attacked by a supernatural entity. The latter are adamant their assailant is an external reality and not a product of their subconscious. However, sleep specialists and psychologists dismiss this by explaining that thoughts, images, and sensations released from an individual’s subconscious are all ultimately alien to the individual. This area is a vast storeroom for random psychological phenomena, which the conscious brain either cannot, or will not analyse and accept as reality. Hence, the victim concludes that all the hallucinatory elements of a sleep paralysis attack are received from an external source. Throughout the world and the passing of time, the above physiological aspects of sleep paralysis have been and remain the same, regardless of the victim’s race, religion, or culture. It is the almost countless interpretations of these symptoms, which make sleep paralysis one of, if not the most common and feared paranormal phenomena. It is beyond the scope and capability of this article and its author to cover all the physiological and psychological aspects of sleep paralysis. Therefore, I have elected to turn my attention to offering the reader a brief overview of the many variations and interpretations of the occult aspects of this fascinating and terrifying phenomenon. Frank De Felitta’s novel, ‘The Entity’ which was later made into a very successful horror movie was in fact based on the alleged true story of Carlotta Moran, a young Californian woman. Her terrifying ordeal from the 1970s is supported by psychiatric reports and physical evidence in the form of bruises to her body. 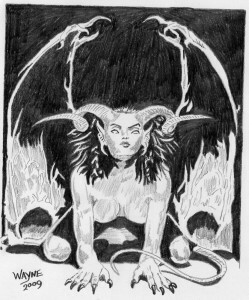 Some researchers claim that Carlotta was attacked by a non-physical male entity known as an Incubus, (female counterpart, Succubus). There are several excellent books and papers available on sleep paralysis. ‘Creatures from Inner Space’ (Stan Gooch) and ‘The Flying Cow’ (Guy Lyon Playfair), and ‘The Terror that comes in the Night’ (David J. Hufford) are just three examples. African culture describes sleep paralysis as ‘The Witch Riding Your Back’. Cabbodian, Laitian, and Thai culture believe sleep paralysis to be ‘Pee Umm’ and Khmout Sukkhot’. These describe dreams of ghostly figures holding down their victims, or merely being nearby. Both terms should not be confused with ‘Pee Khao’ and ‘Khamout Jool’ which refers to a ghost possession. Hmong culture refers to sleep paralysis as ‘Dab Tsog’ or ‘Crushing demon’ In this instance the victim claims to see small child-sized entities sitting on their chests. Many Americam Hmong, (mainly male) have died in their sleep, prompting the Centres for Disease Control to adopt the term, ‘Sudden Unexpected Nocturnal Death Syndrome’, or (SUNDS). Viatnamese culture refer to sleep paralysis as ‘Ma De’, meaning (held down by a ghost or, ‘Bong De’, (held down by a shadow’. Chinese culture believes it to be, ‘Pinyin; gui y ashen’ or ‘Pinyin gui ya chan’. Translated: ‘Ghost pressing on bed’. Japanese culture, as ‘Kanashibari’, meaning (bound or fastened in metal). Hungarian culture folklore refers to sleep paralysis as ‘Lidercnymias’. (Lideric pressing). Here the term can relate to a number of supernatural entities like ‘Lideric’ (Wraith). ‘Boszorkany’ (Witch). ‘Tunder’ (Fairy) or ‘Ordogszereto’ (Demon Lover). The word ‘Boszorkany’ stems from the Turkish root ‘Bas’ meaning (to press). Icelandic culture refers to sleep paralysis as having a ‘Mara’ (Devil that sits on one’s chest at night). Malta culture attributes sleep paralysis to an attack by the ‘Haddiela’ who is the wife of ‘Hares’. To help prevent such an attack Maltese people believe to rid themselves of Haddeila, they must place a piece of silverware or a knife under the pillow just before sleep. Kurdish culture believes it to be ‘Mattaka’. Kurdish people believe the form of a ghost or evil spirit visits them in the night and suffocates them if they have done something bad. New Guinea culture, as ‘Suk Ninmyo’. Here the origin is from sacred trees that use human essence to sustain their lives. These trees feed on human essence during the night so as not to disturb the human’s daily life. Turkish culture, as ‘Karabasan’, (The dark presser/assailer). Mexican culture refer to sleep paralysis as ‘Se me Subio el Mureto’ (The dead person got on me). Southern American culture refers to the phenomenon as a ‘hag’ and it is believed to be a sign of an approaching tragedy or accident. Southwest Nigeria culture describes sleep paralysis as ‘Ogun Oru’ (Nocturnal Warfare). Pakistani culture refers to the phenomenon as encounters with evil jinns and demons. They believe the experience to be the result of enemies performing black magic. Korean culture, as ‘Ga-ui-nool-lim’ menaing (pressed by a nightmare). Tamail and Sri Lankan cultures refer to sleep paralysis as ‘Amuku Be’ or Amuku Pei’ meaning (the ghost that forces one down). Malay culture, as ‘Kena Tindih’ meaning (being pressed).